I was going through my old notes, and came across an email sent to me a number of years ago, which had an old newspaper clipping attached. Since the email and clipping didn’t identify where the clipping came from, I decided to see if I could find the article on Trove. I didn’t, but I found an article for a girl with the same name, that piqued my interest. 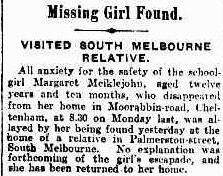 There were a couple of other articles about her disappearance, as well as this article, showing she had been found safe and well. I have done a fair amount of research on the Meiklejohn family, so I decided to check my files to see if she is in my tree. Her age and where the family were living indicates that she was Maisie Margaret Ellen Meiklejohn, the daughter of James John Meiklejohn and Susan Ann Dorward.